Intel says that HDCP has been cracked, but they also say that it’s unlikely this information will be used to unlock the copying of anything. Their reasoning for the second statement is that for someone to make this work they would need to produce a computer chip, not something that is worth the effort. We question that logic. Not so much for Blu-Ray, which is the commonly associated media format that uses HDCP, but for HD digital cable programming. There are folks out there who would like to have the option of recording their HD television shows without renting a DVR from the cable company. CableCard tuners have been mostly absent from the market, making this type of recording difficult or impossible. Now that there’s a proven way to get the encryption key for HDCP how hard would it really be to create a man-in-the-middle device that uses that key to authenticate, decrypt, and funnel the audio and video to another encoder card? 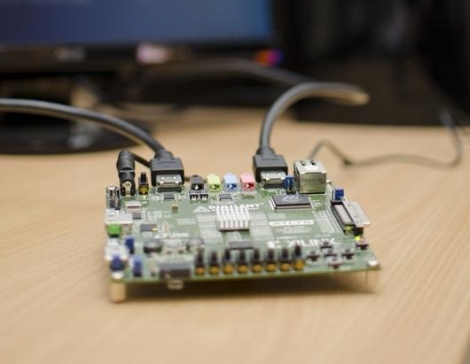 We know next-to-nothing about the protocol but why couldn’t any powerful processor, like an ARM, or even an FPGA (both rather inexpensive and readily available) be programmed for this task? Leave a comment to let us know what you think about HDCP, and what the availability of the master-key really means. Reader [GRitchie] wrote in with an interesting find in his new TV set: with just some minor soldering it was possible to tap into an unencrypted hi-def video stream. HDCP (High-bandwidth Digital Content Protection), used by Blu-Ray players and cable or satellite receivers, normally ensures a DRM-protected link between the device and a compatible display. Any properly-licensed device that forwards HDCP content (such as an HDMI switch box) is expected to provide encrypted output; those that don’t may get blacklisted by the system and become expensive paperweights. It’s something of an annoyance for users who feel this oversteps fair use applications such as time-shifting. [GRitchie] found that his new TV with “InstaPort” Fast HDMI Switching didn’t perform this re-encryption step between the set’s internal switcher and the next stage in decoding. Soldering just eight wires directly from the switching chip’s output to an HDMI cable provided an unencrypted output that could then be received by a PC for later replay. What’s not clear at this point is whether the capability is peculiar to just this one make and model, or applies to anything with the new Fast HDMI Switching. If the latter, it will be interesting to see how this plays out…nearly all of the major HDTV manufacturers are evaluating InstaPort for new sets, which would make any attempt at HDCP blacklisting awkward, to say the least.